How do I Digg a great Web page? I need a better way to help my friends gain visibility when they blog about something cool that I think is of general interest. I’ve heard Digg is cool for this but don’t know how to “dig” an article? You’re talking about the phenomenon of “social bookmarking” and it’s a terrific way to both find and remember all the worthwhile articles you’ve encountered on the Web and to help your pals get a bit more visibility when they have written something particularly terrific. Using Digg is pretty easy on many sites too: for example, if you want to “Digg” this article (two ‘g’s, not one!) you can scroll down just a little ways and find that I have conveniently embedded a “Digg!” link that automatically does most of the work. However, more likely is that you are reading a page where there isn’t any sort of Digg link or, for that matter, a link to any of the other popular social bookmarking sites (de.licio.us and Stumble Upon are two of my favorites). Given that, how do you Digg an article you’re reading? There are two ways, in fact. Both of them require that you start by registering for the site, which is free and spam-free. Once you’ve done that, you can take the simple – albeit invasive – approach of adding a bookmark on your toolbar that lets you easily Digg articles, or you can simply have another tab or window open with Digg and when you see an article you like, Digg it manually. As you can see, the first step is to ensure that it’s cool and interesting, then you’ll want to copy and paste the URL of the story from your Web browser. This can easily be done by clicking in the “address box” of your browser then choosing Edit –> Choose All then Edit –> Copy on your system, then clicking into the text field in the Digg form and choosing Edit –> Paste. It’s already been submitted and 16 people have already “dugg” it, so I’ll just add my vote by clicking on the small “digg it” under the number. Once it’s registered my vote, that changes to “dugg”. Now it’s time to add some additional information so people will know what the story is about and some keywords to make it more findable on the Digg site itself. You’ll also need to come up with a top-level categorization out of the many options shown on the bottom of that screen shot. When you’re done, click “Submit Story” at the bottom and now Digg will try to scan your keywords and see if other stories match. It shows you possible duplicate stories (which I’ve never seen actually are on the same subject) then, finally, you can click on “Continue, Submit” and you’ve Dugg that article! 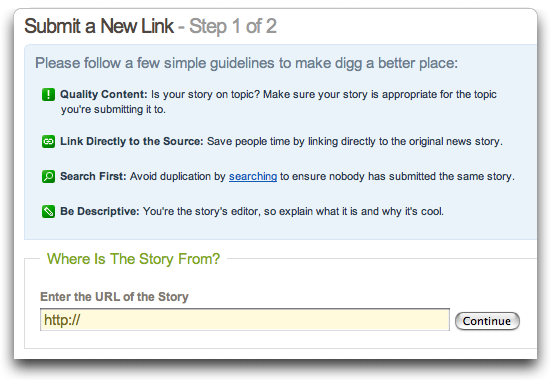 If the “Submit a New Story” link on Digg.com is too complicated for you, then please DON’T submit anything to Digg.